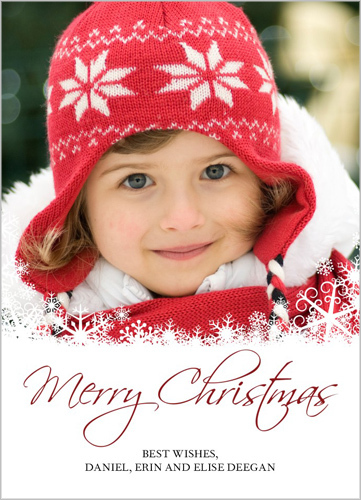 I'm a little behind the ball this year, but it's time to think about Christmas cards already! I normally send out generic cards that I pick up at the store, but this year we are wanting to do photo cards to show family and friends what Aidan looks like now that he's one year old! We have used Shutterfly multiple times in the past. We've ordered calendars, we ordered our birth announcements through them, and of course we've ordered prints as well. 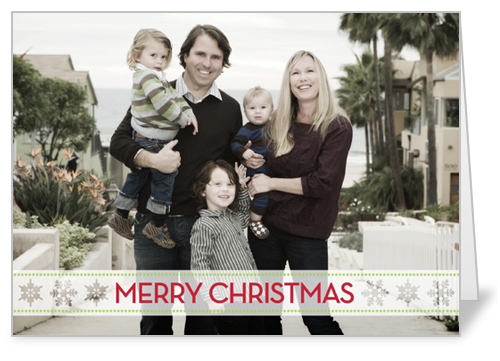 I've never had anything bad to say about Shutterfly, so of course when I saw their Christmas Photo Cards it didn't take much to twist my arm into wanting to order from them. I've been looking around for a while now and I can't figure out which type I should get! Option 1: This would of course have a picture of Aidan front and center! Option 2: This could be either a family shot, or a single shot. I was thinking more family style, as shown above. Both are 5x7 cardstock, and I just know they will be wonderful quality if my past experiences with Shutterfly have anything to say about it! I do believe I prefer the folded card, just so I can personalize each card without having to include a seperate note for each, but I'm leaving it up to you guys! Any preferences about which one I should get? Any ideas on what type of photo I should use in my cards?